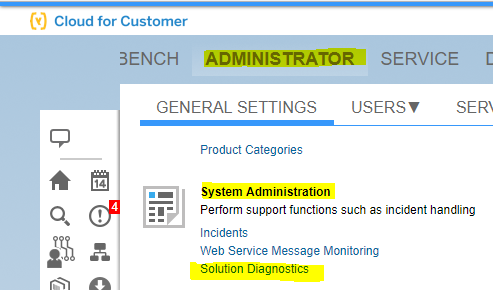 The Solution Diagnostics are a tool within the Administrator Workcenter of your SAP Hybris Cloud for Customer solution, which you can leverage to identify potential issues in performance and stability in your tenant. When opening the Solution Diagnostics, it will by default display all issues available. By using the advanced filter in the list, you can filter for specific categories, types of issues and priority. A regular check of this tool is recommended, as the reports that populate this list of issues are running weekly. The result list shows the selected potential issues, which were automatically identified by the system through different mechanisms. Be aware that not all items in the list might necessarily point to definite problems, but each entry requires a manual investigation, based on the type and recommendation of the problem. The five different types are detailed below and also explained within the video at the bottom of this article. 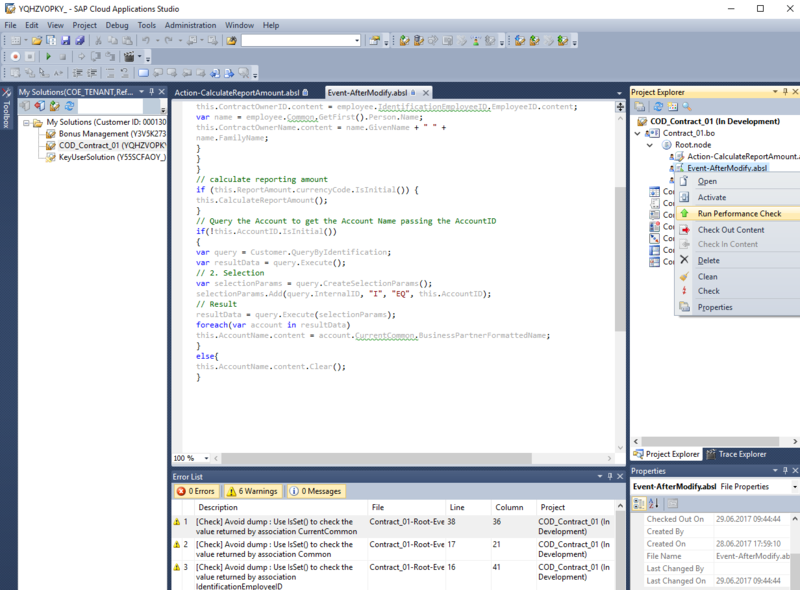 In this example, the first row is the “header”, indicating the start of the check for “Possible Dumps due to missing IsSet() Checks”. After that, the list of identified issues follows, with two rows per entry. The first row indicates the type of error, e.g. “Avoid dump : Use IsSet() to check the value returned by association CurrentCommon”, while the second row provides more information about the exact location in the file, where the issue can be found. As a further help to identify and fix the problem, you can run the Performance Check for the file in question within the SAP Cloud Applications Studio. For that, just right-click the .absl file within the Solution Explorer and select “Run Performance Check”. The same errors/warning, as visible within the Solution Diagnostics, should now appear within the Error List of the SAP Cloud Applications Studio. Issues of this type point to Runtime Errors (“shortdumps”) that were caused by custom code (PDI).